Since the dawn of history, mankind has always quailed helplessly before the elemental forces of nature. For at least the past ten millennia, history depicts us as either worshipping these formidable forces or viewing them as the work of wrathful gods – raining down retribution upon their awestruck and trembling flock. The rise of technology has helped us little in this regard, other than giving us tools to observe their origin and behavior. By means of seismological tools we can now, more or less precisely, track the origin, trajectory and force of earthquakes – and dodge them if we are lucky. Satellites give us similar data and warning about ocean storms – and at least a chance to escape. The same is true of other natural disasters, such as flooding, droughts, and forest and steppe fires. (Our measures to fight the latter are deemed successful only if the fire is not really heavy). Our struggle against natural disasters and whatever successes we achieve require huge human and technical resources and the outlay of sizeable amounts of money. All of our attempts to combat such disasters are extremely limited. For example, the attempt to influence storms and fires through dispersion of chemical substances has no serious impact upon them. Then, too, aside from the expense, such substances are chemically aggressive and only worsen the ecology, leaving much to be desired in terms of their usage. Moreover, our understanding of the nature of such disasters is rather far from reality. How we interpret the nature of hurricanes – the main protagonists of our «novel» – remains at the conceptual level of someone saying, «The wind blows because the trees are swaying». No one has ever attempted to explain why air masses move in one particular direction rather than another. The current hypothesis about the heating and cooling of air masses does not have the answer. When molecules of air absorb the infrared radiation of heated earth or heated ocean water, their kinetic energy changes as well as the atmosphere pressure. However, the explanation of the nature of change of the atmospheric pressure is not good at all. The atmosphere is a gaseous medium, composed of molecules that move chaotically. As each atmospheric molecule absorbs a photon of infrared radiation, it continues to move just as chaotically as it did before the absorption. Therefore, according to the theory of Brownian movement, the general configuration of atmospheric molecular motion should not change at all. This is true whether the molecules either speed up or slow down – in other words, the principle of the chaotic movement remains the same. However, the air masses get into motion resulted in a mere breeze, a wind, or a hurricane. Certainly, we run into breezes almost daily, and from time to time we come across strong winds. And fortunately, the average person only seldom has to deal with a hurricane. However, regardless of the speed of the air masses in motion, we come across with this phenomenon every day. Yet, existing theories cannot explain a phenomenon that any child can readily identify – namely, the blowing of the wind. Pressure gradients registered by tools does not explain why air masses start to move precisely in one given, specific, direction rather than in any other. After all, the concept of vertical atmospheric pressure and temperature gradient is a measurable phenomenon perfectly well-known for everybody. Perhaps many people had the possibility to observe around a campfire how heated air and its accompanying smoke raised in an upward vertical path and not horizontally nor extensively. The heated air rises upward where the air is colder, and the higher it goes, the lower the air temperature. Airplane passengers may also remember messages about the temperature overboard at the altitude, for example, of 10,000 meters. Usually it reaches 40-50 degrees centigrade below zero. Only ten thousand meters from the surface of the earth and the temperature gradient becomes 70-80 degrees centigrade. Such a sharp temperature gradient does not exist along the surface of the earth, even at considerable areas of hundreds of kilometers. It amounts to 20-30 degrees centigrade at most. However, the air masses start to move horizontally, parallel to the surface of the planet and not vertically, which logically simply cannot happen. What is the reason of such discrepancy? This problem is complacently ignored, however, as are many other similar problems. And the single cause for this is the inability to give a reasonable explanation of this phenomenon from the viewpoint of contemporary physics. Why, when we heat the air in a balloon, it rises upward, that is – it is elevated. However, the air heated over a large surface, «for some reason», starts to move along the surface instead of upward. There is no discrepancy if we consider this phenomenon from an absolutely different position based on our understanding of the fact that the Universe is anisotropic (i.e., non-uniform or non-homogeneous). The anisotropy of the Universe means that qualities and properties of space are not identical in the different directions and the matter in any of its forms is also non-uniform as well as its qualities and properties. The anisotropy of space and matter is backed by numerous scientific studies employing the most exact tools the contemporary science ever had. The reason of our planet’s strange atmospheric behavior is the following: at the micro level a heated molecule (which absorbs a photon of thermal radiation) and the cold molecule (which does not absorb a photon of thermal radiation) differs from each other qualitatively. That is, two atmosphere molecules identical in all physical and chemical characteristics known to a modern science differ qualitatively from each other by the degree of their influence on the surrounding microspace. And this difference is a result of absorption of a photon of infrared (thermal) radiation by one of these two molecules. When a molecule of air absorbs or releases thermal photons, the level of self-dimentionality (the degree of influence which a given molecule exerts on its surrounding microspace) changes. The level of self-dimentionality increases when the molecule absorbs a photon and decreases when it releases the photon. Thus, when we heat air molecules within a limited space (such as a balloon) we produce a floating effect: that is, the masses of cold air that surround the heated molecules within the balloon all maintain the same level of self-dimensionality. At the same time, the heated molecules inside the balloon exert an additional effect on the microspace introduced by the thermal photons. This produces a vertical dimensionality gradient directed upward and a partial antigravity effect. As a result, the molecules caught inside the balloon perform the work of forcibly lifting up both the balloon and a basket attached to it. The similar phenomenon occurs when the balloon is filled with the gas, which has greater level of self- dimensionality than the atmosphere. The more dimensionality gradient between the levels of self-dimensionality of gases inside the balloon and the levels of self-dimensionality of atmospheric gases, the greater the lifting force. Similar phenomena are observable in both liquid and solid substances. For example, processes involved in the formation of lattices occur in a similar way except for some peculiarities. In crystals the antigravity effect occurs only with heating (when atoms of a crystal absorb thermal photons). When a critical number of thermal photons are absorbed, the antigravity effect becomes commensurate with the nuclear forces that keep the atoms in units of crystal lattices and the substance turns into a state of liquid crystal or simply into liquid. If the process of heating (i.e. absorption of thermal photons) continues, the antigravity effect becomes much stronger than the nuclear interaction and the substance will pass into a gaseous state. Herein lies the mechanism of transition from one aggregate state to another. The phenomenon of so-called «sublimation» (when, in the process of heating, a substance passes from a solid state to a gaseous) is a perfect confirmation of the above-mentioned. Traditional science has never explained this, though it can be quite easily explained. Atoms absorb thermal radiation in the form of infrared radiation photons. When an atom absorbs one thermal photon, the level of its self-dimensionality changes by a certain discrete amount – this is a stepwise process. In other words, the atom changes its self-dimensionality level every time it absorbs a photon. In the case of a substance having a self-dimensionality gradient that is less than the amplitude leap of the atom’s self-dimensionality during thermal photon absorption, sublimation occurs, i.e. the substance passes from solid to gaseous, rather than to a liquid. We could go on at length explaining all manner of natural phenomena from the standpoint of space and matter anisotropy. However, our thrust here is the understanding of atmospheric natural phenomena as a particular example of space/matter anisotropy. So let us pass from processes unfolding at the atomic level to processes at work at the atmospheric level. When the bottom-most layers of an atmosphere overspread an area of considerable size, billions and billions of atmospheric molecules absorb thermal photons. This occurs at the microcosmic level, since each individual molecule undergoes a change in its self-dimensionality. The cumulative effect of the molecular changes leads to a change of dimensionality at the macrocosmic level. At the same time a vertical gradient of dimensionality still remains. The appearance of this additional (horizontal) gradient of dimensionality between adjacent areas of the atmosphere leads to the following: the heated molecules of the atmosphere start to move not only upwards but also sideways, i.e. along the surface of the planet. This movement along the planet’s surface is precisely what is known to everyone as wind. The force of the wind depends upon the dimensionality gradient produced between adjacent areas of the atmosphere, one of which is heated while the other one is not – or otherwise cooled (when atmospheric molecules release thermal photons). The larger the gradient, the higher the speed of air masses along the surface. Without this gradient, there is no movement of air masses and therefore no wind. The above is crucial for grasping what follows. Let us now consider the origin of hurricanes, that every year, with greater or lesser intensity, pummel the eastern coast of North America. These hurricanes are born at the turn of two oceans — the Atlantic and the Indian. One washes western Africa, the other — its eastern seaboard. Both oceans merge in one in the south of the African continent. Every ocean has its own distinct currents, possessing their own velocity, direction and water temperature. Therefore, when cold and warm currents of these oceans collide in the South African coastal waters, conditions arise for triggering abrupt dimensionality gradients between adjasent areas of the atmosphere. The contour of the southern part of the African continent also adds to this effect, since the relatively small length of the southern coast of Africa does not allow the temperature of these ocean currents to even out to some extent. Thus, several ocean currents with vastly different water temperatures collide with each other in the coastal waters of southern Africa – running parallel to each other for some time. As soon as they hit the Cape of Good Hope, they begin to whirl about and create turbulence. It is exactly the creation of such areas of turbulence that is responsible for forming hurricane storms, which, gaining in strength on their path of destruction fall upon the eastern coast of Central and North America. The storm season begins when the water in the equatorial and tropical areas of the oceans become considerably heated up. This leads to a rise in the temperature of the warm currents, while concurrently the currents coming from Antarctica in the southern hemisphere (where our summer is their winter) have the lowest temperature. Sooner or later, depending on the seasonal weather conditions, a temperature gradient of colliding ocean currents reaches a critical value and – superstorms are born, strikingly different from the usual tropical storms that constantly appear in the coastal waters of South Africa. These superstorms (hurricanes) are huge cloudy formations (some of which reach the size of several European states) reminiscent of anfractuous Galaxies (Fig.1). They are divided into five categories. For example, a category 5 superstorm reaches a speed of 155 m.p.h. (248 kilometers/hour) and can go higher. Such a hurricane, on landfall, sweeps away everything in its path, saturating the ground with billions of tons of water carried in its clouds. This, in full measure, can be called a natural disaster. Of course, there is no technology that can cope with this. And humans lose heart before this catastrophe, fleeing their homes before a superstorm overtakes them and then goes on a rampage until it gets exhausted. Our technocratic civilization has programmed people to think that man minus his machines is nothing – except a pitiful appendage to civilization’s technical trappings. It is an enormous error. To accomplish something significant, we need to work at attaining a certain level of development and knowledge. Early in life I became aware that very often all I had to do was wish and the weather would change (e.g., starting or stopping a rainfall). At first, I paid no attention to this and thought I was just terribly lucky. Every time I planned to go out of town in my day off, the weather was absolutely perfect despite the fact that during the whole week the weather had been inclement and wet. Noticing how often this happened gave me the idea that all I had to do was simply imagine a fine, sunny day for it to materialize. Conversely, if amongst a summer heat I pictured the sky with heavy cloud formation and raindrops falling down more and more… and in no time the clouds would appear in the sky and would quickly increase, the sky would darken and a wall of warm summer downpour would saturate the ground. Thunder and lighting would then follow, refreshing the air and filling it with ozone. Similar episodes kept happening to me so often that I felt they were more than just simple coincidence at work. Sometimes I had to do conversely, as it happened in the following episode: In 1985, while serving as an army officer in Ilichevsk (near Odessa), I was granted a leave of absence, just before the New Year. I purchased a ticket to Kharkov and, having reached the Odessa airport, found that my flight had been postponed indefinitely due to inclement weather in Odessa, Kharkov and Sverdlovsk. And our plane had not yet taken off from Sverdlovsk. Not wishing to spend all my holiday at the airport – and from the first moment I learned about the weather situation – I began willing intensely that the fog blanketing all three airports (Odessa, Kharkov and Sverdlovsk) would disappear. Every hour spent in that airport was like punishment. After several hours, the weather cleared up in Odessa and we were summoned aboard. I spent my leave of absence in Kharkov and upon arriving at the airport, found the same inclement, flight-canceling weather there. However, after several hours, the weather turned fine and … I safely reached Odessa. Only later I learned that the inclement weather I had encountered lasted for several weeks and that the change to flying weather had appeared only twice, for half a day, during that period – first upon my arrival in Kharkov and second at my departure from it. Following my return home, the inclement weather actually continued for two weeks more. Among the many examples I have, there is one episode that served as a «clincher» in convincing me of my conscious weather control ability. On December 31, 1991, my wife and I arrived in San Francisco. Early in February, we were invited to the home of a mutual acquaintance, George Orbelian, who later became a close friend. While sitting on his terrace we spoke of many things, including the possibility of controlling the weather. When I mentioned some experiences of mine, George exclaimed enthusiastically, «That is really great! Make it rain! For the last six years, there hasn’t been a drop of rain here. And scarcely anyone can remember a similar drought in which something like what you do ever happened at all». I promised to help with the problem, but George insisted, «Why postpone it? Do it now». I proceeded to concentrate on this task and in half an hour it was raining. At the beginning the rain was weak, giving rise to much hilarity and joking. I then had to concentrate a little more – and it was pouring cats and dogs. The jokes stopped immediately. However, in retrospect, it would have been better had I not done it. The huge downpour in San Francisco triggered floods in Los Angeles and many houses in southern California were toppled. On the other hand, the situation in San Francisco turned out just fine. It continued to rain non-stop for several days. Since that time, fifteen years ago, California has had no rain or water problem. Prior to the six-year drought mentioned above, precipitation had been more or less regular up to a certain season, after which it had become very sparse. Thanks to above, I had enough real confirmation that it is possible to control weather – that it was not mere fantasy or the ravings of a lunatic. Having dispelled my doubts as to whether this kind of activity was possible, I now faced the challenge of finding the correct «key» to «unlocking» every concrete task – and the deeper understanding, the greater probability of resolving it. By chance, the decision to interfere with the natural activity of a hurricane came to me quite unexpectedly. At twelve midnight on the evening of October 3, 2002, I happened to be surfing the TV channels when I caught some news from the U.S. eastern seaboard, where it was already 3:00 a.m. of October 4. According to a reporter on the scene, a hurricane named Lily was bearing down on the region and had already reached the status of category 4. He added that the local inhabitants had already been evacuated from the danger zone, and, that judging by the increased severity of the wind and rain, and the height of the waves battering the coastline, Lily’s approach was imminent. At that moment, the idea struck me that I could try and stop this hurricane. The strategy was simple – to even out (i.e., equalize) the self-dimensionality levels of the atmospheric molecules in the vicinity of the superstorm. The easiest way to do so would be to trigger simultaneous (coherent) thermal radiation of photons by the atmospheric molecules in the area of the hurricane. This would eliminate the dimensionality gradient between «heated» and «cold» molecules in the vicinity of the superstorm activity, thereby getting rid of the natural factors giving rise to the creation of a superstorm. In other words, by eliminating its causes I could eliminate the superstorm itself. This is precisely what I tried to accomplish. After completing the work I set out to do, I retired for the night. First thing in the morning, I switched on my TV and began awaiting some news about Lily. To my great surprise – by the morning there was nothing left of Lily. (Fig.2). As clearly shown on Fig. 2, from the first moment I began my work, the hurricane’s wind velocity abruptly began to abate. Within several hours, Lily had changed from a category 4 to a category 1, then to a simple tropical storm and finally died. (Fig.3). Stages tracked in Figs.3, 5, 8, 9, 11, 12, 14, 15. It is noteworthy that Lily’s main destructive force was dissipated long before it reached landfall. One may protest that such behavior is quite typical of hurricanes. We grant that people are entitled to their own opinions. «Before Lili could blast ashore, the storm encountered too-dry air out of the west and too-cool water near the coastline, where, incidentally, the hottest Louisiana red-pepper sauce is made (Tabasco is bottied on Avery Island in New Iberia parish). That — among a combination of other factors still unknown — bumped Lili down to a Category 2 hurricane, still dangerous but drastically less powerful than official expected». «A lot of Ph.D. [dissertation] will be written about this» storm's rapid loss of strength, said Max Mayfield, director of the National Hurricane Center in Miami. (Lili leashed, p.9, October 12, 2002, World). First, it is obvious from the above, that experts well versed in the nature of hurricanes had never seen such a phenomenon. Second, from where had this ice-cold water appeared right in the middle of a shallow Mexican gulf? Let us remember that this gulf lies in tropical and sub-equatorial zones where its water undergoes heating all summer long. Third, from where did the dry air materialize amidst the super-moist air – especially since at the same time, the air surrounding the hurricane usually becomes very moist? Fourth, what other factors still unknown to specialists may have interfered with the natural behavior of the hurricane? No one has answered any of these questions. This is hardly surprising if we view this phenomenon from the standpoint of the conventional scientific position. Let us assume that somebody «somehow» could deliberately produce throughout the entire hurricane a synchronous emission of thermal radiation photons from molecules of the atmosphere and molecules of the gulf water: this would easily explain the presence of cold water and very dry air over the gulf. That is exactly what happens when the self-dimensionality level of the atmospheric molecules are equalized. An abrupt cooling of the air over the gulf leads to a dehydration of the air masses. As is usual in the cooling process, water vapor of air masses, after reaching the dew point turns to liquid and becomes rainfall over the gulf waters, thereby causing their abrupt cooling. And this is exactly what was observed. We have already detailed above how the movement of air masses originates, and will therefore recall only the basic principle. In the presence of the gradient of self-dimensionality levels, a horizontal component of gravity occurs between nearby areas of the atmosphere. This component causes air molecules to move parallel to the surface of the planet. When the self-dimensionality levels are equalized, the horizontal gravitational component will disappear and that will lead to a cessation of movement of the air masses along the surface. In other words, the lower the dimensionality gradient, the lower the wind velocity. This is what occurred with hurricane Lily: the wind speed and strength dropped precipitously and extensively, owing to the equalization of the dimensionality level throughout Lily's entire volume. Three hours later, after reaching the mainland, it settled down to a category 1, became a tropical storm within the next three hours, and then completely died. But, we may ask, do all hurricanes behave this way over the mainland? Let us look at the trajectories of some previous hurricanes and their behavior (Fig.4). Figure 4 shows trajectories of category 5 hurricanes up to the year 2000. None of these ever lost an iota of their force before blasting ashore. Further, the wind velocity has never dropped, even minimally during the six hours of hovering over the mainland, as occurred with hurricane Lily. In fact, all the hurricanes continued moving for several days after reaching the mainland, and many of them returned to the ocean. Only one — Andrew (1992) — subsided over a mountain range. Rather, those other hurricanes, after taking a «tour» over the mainland, returned back to their watery environment without any significant loss of force, and, reinvigorating themselves, kept on moving. But could Lily be an anomaly, an exception to the rule? Skeptics will simply counter that there are anomalies in nature that are inexplicable. Obviously when a skeptic acknowledges that something inexplicable is occurring (in other words he or she can not explain it) it just leads to a simple phrase-mongering. Anyone has a right to express an opinion (even an erroneous one) if he or she offers an accurate and full explanation of his position. Otherwise, it is an idle philosophizing. Moreover, even admitting that skeptics have the right to refer to «anomalies» it won’t be them of much help — if several identical anomalies are observed, they are not really «anomalies» per se, but actually repetitively occurring «regularities». In 2003, some friends of mine who knew about my «joust» with Lily, alerted me to a powerful, new hurricane, «Isabel», barreling down the Eastern coast and rapidly growing stronger and stronger — even reaching category 4 status while still very far from the coastline. To tackle Isabel, all I had was satellite photos found on the internet, appearing with a time delay of several hours. Thus, at the very moment I was working on them, Isabel was actually 50-60 miles away from the photographic site. This, in itself, was hardly an optimal condition for work. However, after my first intervention, the wind velocity stopped increasing. During the day and a half the wind velocity did not change at all — which in itself is an impossibility. The next intervention took place four days later, almost at the very moment that the speed of the hurricane began to accelerate and intensify. And, again, the wind velocity remained the same during an entire day and a half without decreasing. The strength of Isabell almost reached a category 5 and though, in concordance with all natural laws the force of a hurricane in warm waters is due to continue growing, the strength reached by Isabel was already extremely dangerous. At this point, I managed to abort and slightly decrease a new resurgence of force; nevertheless, Isabel approached the coast with considerable speed (about 90 miles per hour).Therefore, using the same time-lag satellite photographs, I intensified my influence on the hurricane. In other words, a greater degree of influence was now necessary: the intensity of the hurricane began to drop sharply, within the space of two days (October 15 through 16), despite the fact that hurricane intensity always increases over warmer waters. But Isabel’s strength plummeted almost three categories, to a status of category 2. It is important to note that when worked on in real time, Isabel’s reaction to my influence was almost identical to Lily’s. Isabel’s trajectory is shown in Fig.6. Prior to the hurricane season of 2004, I had approached a producer of documentary films who knew about my work through one of my trainees, Dr. Barbara Koopman. I offered to do a film of my work on hurricane suppression, if he would provide me the opportunity of working through satellites in real time. Initially he seemed interested in such a project, but as time went on – nothing came of it, and hurricanes are not in the habit of waiting. By the beginning of August, a hurricane named Charley launched the season of 2004. Bearing in mind the relatively meager effect working through time-lag satellite photos, I decided to change my tactics with this hurricane. Instead of interfering and trying to abort its development, I decided to create a «wall» in its path from which it would have to ricochet off, like a bouncing ball. I alerted some interested spectators of my intention. My idea was to drive the hurricane back to the ocean by cutting off its access to the land. And this is what I managed to do. However, because I lacked the exact information, the “bounce” off the wall landed Charley on a sort of “corner” so that instead of dropping down on Louisiana, Charley made a (very unusual) sharp right angled turn, veering from the middle of the Gulf of Mexico towards Florida (Fig.7). Also, another never-before-occurring event was also recorded: After growing in strength to a category 4, hurricane Charley approached the Florida peninsula – not from the Atlantic Ocean, the usual approach of such hurricanes – but from the Gulf of Mexico instead. And in the warm waters of the gulf, Charley very rapidly gained in strength (Fig.8). Thus, I manipulated Charley before it could hit the western coast of Florida. Evacuation actually occurred in Louisiana; in Florida, nobody expected this hurricane, so I had to work very quickly. However, thanks to a weather channel broadcasting directly from the gulf coast, I was able to do so. As with the previous experience, working in real time proved to be the most effective and correct approach. Before striking the peninsula, the force of the hurricane, within the first several hours, dropped from a category 4 to a category 1 and continued to drop even further. Charley, at this point classified as category 1, proceeded to return to the Atlantic Ocean. This surprised the experts who had warned that over warm water, Charley would regain its strength and again strike the east coast to the northeast of Florida. I then undertook one more maneuver with the following result: this time, instead of intensifying in strength, Charley weakened rapidly and in the space of several hours became a tropical storm, hitting the northeast as a tropical downpour, then disappearing without a trace. The next hurricane did not wait very long to show up. A superstorm named Frances was born in the waters of the Atlantic Ocean. It began to intensify rapidly and quickly reached a huge size. Working with this hurricane, I still had satellite photos, with a time delay of some hours. When the hurricane speed had reached category 4, my intervention resulted in stopping its further acceleration. Throughout the entire day, the speed remained constant and the force of the hurricane began to decline; however, the wind velocity did not decline very long and the hurricane began again to gain in strength (Fig.9). On the evening of September 1, 2004, the next intervention was made and, again, the wind velocity stopped accelerating and the strength of the hurricane remained at the same level for more than a day. At the same time, I changed my strategy and tactics slightly by focusing more attention on the fundamental cause of hurricane formation – a maneuver that gave positive results immediately. Within two days, the hurricane started weakening, dropping from a category 4 to the lowest range of a category 3; this contradicted all expectations about «normal» hurricanes, which according to physical laws should strengthen over warmer waters. Though not as dire as a category 4 or 5, a category 3 hurricane still continues to be quite dangerous and destructive. Therefore, I made my next intervention in the evening of September 3, 2004. And again, following this, wind velocity remained «frozen» (unchanging) as it were, and then the force of the hurricane began plummeting rapidly. As the hurricane neared the coast of Florida, it continued to weaken – contrary to all the laws about the behavior of hurricanes. Utilizing direct broadcasting from the east coast of the peninsula, I once more exerted influence on hurricane Frances. It was 1500 hours, USA Eastern Time of September 5. Following this, the wind velocity dropped sharply on September 6 and 7, the net result of which Florida actually got hit by a category 1 hurricane which quickly lost its force and turned into a tropical storm. Upon entering the Gulf of Mexico, the tropical storm, which, in principle, should have gained strength over the very warm waters of the gulf, actually continued to lose speed and degenerated into a tropical downpour before it reached the inner coastline of the gulf (Fig.10). And again an interesting phenomenon was observed. After my work in real time on September 6 with hurricane Frances, a sharp drop in wind velocity occurred not only to this hurricane, but also to a hurricane named Ivan which was gaining in strength and situated hundreds of miles away from the coast (Fig. 11). The reaction of Ivan to my work in real time was as strong as that of Frances, but, nevertheless, the force of the hurricane fell from a category 4 to a category 2. Following this, the wind velocity began to pick up very rapidly and by September 9 the hurricane reached a category 5. Using satellite photos of Ivan, on the latter half of the day of September 9, I made my first intervention. Within two days, the hurricane strength declined a little, when it supposedly should have continued to grow. By September 12, the hurricane again reached category 5, at which time I again intervened. The velocity at first dropped slightly, but, within one day, it again reached category 5. On September 13, I made my next intervention. This resulted in «freezing» the wind velocity at the same level for one and half days. I then intervened again, this time with revised tactics. And, from the latter half of the day, on September 14, Ivan began to lose strength, but upon approaching the coast it was still a category 4. The main impact of the hurricane was aimed at the New Orleans coast, which was facing the threat of exposure to catastrophic consequences. In particular, the city would be flooded if the dams were destroyed, to say nothing of the other damage a category 4 could wreak. On the morning of September 16, I applied influence in real time with the maximum degree allowed, considering the danger of the situation. This resulted in a sharp drop in Ivan’s force before it reached the coast. And what remained of Ivan as it reached the coast was a category 1 hurricane that within several hours became a tropical storm, finally degenerating into a tropical downpour. During this time frame, a very curious phenomenon occurred with a hurricane named «Jeanne» which was gaining in strength but began to weaken considerably from the latter half of the day of September 16 to the end of the day of September l8, precisely at the time that Ivan sharply declined after my influence in real time. Jeanne, synchronously with Ivan, reacted to the influence exerted on Ivan in real time. A similar synchronous reaction to influence on Frances in real time was observed also with Ivan. So, rather than two «anomalies» we were really observing «regularities». After such a resonant reaction to influence in real time, Jeanne began to gain in its strength slowly and, by September 25 reached category 3. At this time the first direct intervention on Jeanne was made, after which it lost strength very rapidly and, by September 28, degenerated into a tropical downpour without even coming close to the coast (Fig.12). It is noteworthy that the trajectories of these two hurricanes, Ivan and Jeanne, practically repeated each other, synchronously changing directions of their movement: Like partners in a pair figure skating performance, they synchronously executed a full 360 degree turn. Such a phenomenon had never before happened with one hurricane, let alone with two hurricanes simultaneously. (Fig.13). No one even attempted to offer an explanation of this behavior. Only the New York Times reported that «… obstinate hurricanes, having made a full turn reached the land however in the form of a tropical downpour («A Stubborn Storms Hangs On In a Busy Hurricane Season», The New York Times, 9/24/04). However, among the various hurricanes upon which I exerted influence, hurricane Daniel of 2004, occupies a special place. I had intervened during its formation, when it still had not yet reached its maximal force. Yet, despite predictions of its becoming a huge and powerful hurricane, it «fizzled» utterly during its trajectory to the east coast of North America (Fig.14). The reason why this happened no one could explain, perhaps because of its incomprehensibility. It is easier simply to say nothing and «perhaps» no one will notice or ask anything. This happens often enough – not only among meteorologists. The development of «conventional» hurricanes i.e. not influenced, occurs similar to that of Floyd, 1999. There was no observation reported of any significant loss of its strength before hitting the coast. It was weakening slowly enough, in the process of moving to the north where the colder waters of the Atlantic Ocean could not support its development (Fig.15). Thus, the behavior of all hurricanes that were not exposed to influences was practically the same, whereas hurricanes subject to influence behaved in an absolutely different way. And all of the «influenced» ones behaved in a surprisingly similar manner, which differed from that of «conventional» hurricanes. Within the past fifty years, meteorologists have accumulated a large amount of data about the nature of «conventional» hurricanes; however the behavior of «influenced» hurricanes has never been included in these data. No «conventional» hurricane has ever lost a substantial amount of its force before barreling down upon a targeted coast; on the contrary, it generally gains in strength as it approaches landfall. The closer it is to the coast, the shallower the depth of the ocean and the warmer the water – the stronger the hurricane’s force. Only very cold water and very dry air can sharply diminish the force of a hurricane. Therefore, a sharp drop in the strength of a hurricane, which is approaching landfall, above the summer-heated waters in the shallow Gulf of Mexico, cannot be explained rationally. Nor can anyone explain why, after the hurricane has passed, the water in the gulf becomes as warm as it was before the arrival of the hurricane, or why this came about without any changes of weather in the region. So how do we unravel this conundrum? Water beneath the trajectory of a raging hurricane abruptly grows cold, and the ambient air becomes suddenly dry for a period of time-then everything returns back to its initial condition. And this occurs only within the limits of action of the hurricane, while on adjacent sites in the gulf, the water remains warm and the air damp. Such a natural anomaly can by explained only by some kind of outside intervention in the unfolding process. Modern civilization has no technical means or resources to cause such anomalies, nor is it likely to have them any time soon. Only two possibilities remain – intervention by aliens or by «higher forces» of a divine nature. However, no one observed the presence of UFO’s in the vicinity of «unconventional» hurricanes, despite continuous monitoring both from satellites and from special planes accompanying every hurricane moving toward the coast. And if the monitoring of such hurricanes, for any reason, yielded no signs of a UFO presence, we may raise another question as to why these particular hurricanes were chosen for experimentation, rather than any others. Further – why was nothing like this done earlier? To anyone capable of rational thought the answers are clear. However, some people of a skeptical bent may clutch at their last straw – God. But «divine straw» cannot give answers, to these two questions too. Regrettably, such «true believers» would be more willing to credit God or the devil than to admit the possibility that someone who has evolved enough – with the requisite knowledge, potential and understanding of nature – is capable of such activity. And yet such «true believers» know practically nothing about the human being and his capacities. And if the majority of people are incapable of performing similar feats, this does not mean that they are impossible to do. With proper development one can penetrate new and greater levels of achievement and opportunity. This involves no miracles nor «divine essences» but only enlightenment through knowledge and the skill of using new capabilities correctly. In the interim from 2002 to 2004, while working with category 4 and 5 hurricanes, I was able to demonstrate an ability to influence natural processes without compromising the balance and harmony of nature. The data presented are from the archives of the National Weather Service (NWS) and the National Oceanic Atmospheric Administration (NOAA), two impeccable and trustworthy sources. Following the successful neutralization of hurricanes Lily (2002) and Isabel (2003), I proposed to certain interested authorities a research experiment to be conducted before the onset of the 2004 hurricane season. I suggested filming all my hurricane interventions in real time, working directly through the USA satellite weather monitoring system. I stipulated only one condition – an airing of the photographed documentary of my work on US national television, which was accepted. 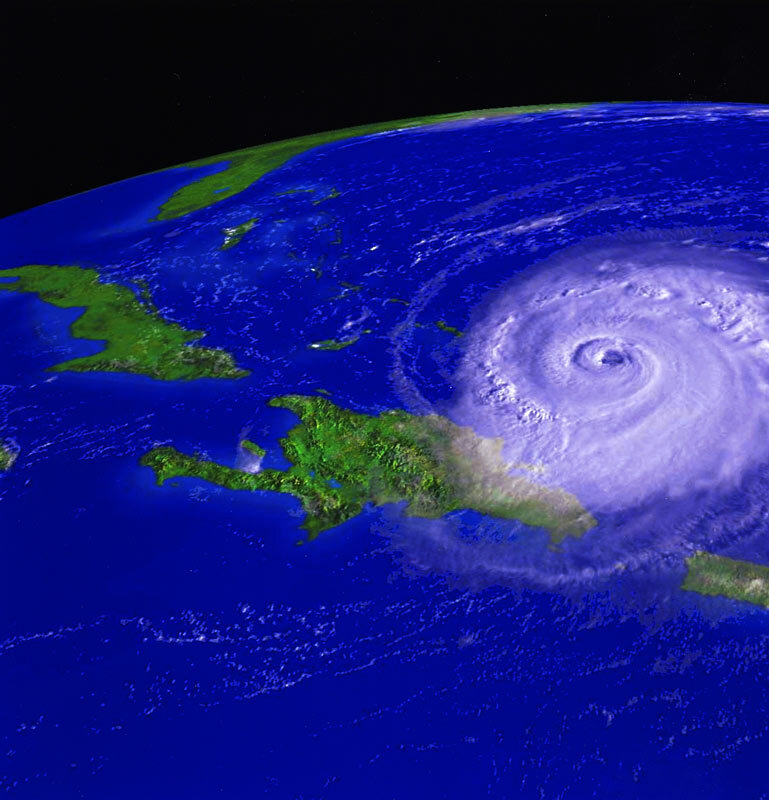 The storm season of 2004 lasted four and a half months – replete with very intense hurricanes. At the very least, I neutralized all hurricanes of this season and their consequences – which, as a result, turned out to be largely in the form of heavy precipitations, thereby having relatively little effect on the US economy. My requirement to disseminate the documentary evidence of my work was not motivated by desire for personal gain or celebrity. Rather, it was to show the world the possibility of a non-technocratic development of civilization, which would avoid the ecological catastrophes and self-destructive behavior of technocratic civilizations. The authorities involved not only failed to honor their agreement, but also reneged on testing my ability to neutralize a meteorological weapon which they had at their disposal. For this reason, I decided to stop intervening directly with the behavior of hurricanes, as per my admonition to them just prior to the 2005 hurricane season. Instead, I left in place a stationary system along the coast, designed to achieve partial attenuation of a hurricane’s force. As had been previously shown in operation, this system was able to weaken the force of Katrina from a category 5 to a category 3. Thanks to the neutralization of hurricanes during those prior three years, the state authorities had practically ceased preparatory measures for prevention of the kind of spontaneous natural phenomena that were unleashed in full measure during hurricane Katrina. This hurricane not only caused many fatalities but also triggered 300 billion dollar losses and an economic crisis in the USA. Under the circumstances, I do not consider myself obliged to neutralize all the spontaneous natural phenomena that beset the US government. In practice, the wall I made along the east coast of North America not only noticeably attenuated the force of active hurricanes, but also prevented their making landfall on US territory. As shown in Fig. 16, not only did Wilma get bumped from a category 5 to a category 1, but was also barred from entering the Gulf of Mexico and forced to move above the ocean along the east coast of North America. I have created a similar wall for the first time but still do not know whether it will work for as long as I intended. Probably, by the onset of the up-coming hurricane season, I shall either renew it or dispose of it. We shall see but nevertheless – the data show that it really works. In the history of hurricane tracking, there was never any hurricane documented that executed a 90 degree turn, except for Charley (Fig.7) when I tried for the first time to create a protective wall in the Gulf of Mexico. Today, September 4, 2007, I decided to dispose of the wall I had created for keeping hurricanes in check. Regrettably, the presence of the wall caused hurricane Felix, category 5, to collide with it at an angle, executing an almost 90 degree turn and then bearing down on the Yucatan Peninsula. Felix did not get into the Gulf of Mexico, but, nevertheless, its destructive force battered the terrain of the Central American countries. The restraining wall has been protecting the USA, but not the other countries— and I consider this unacceptable. My decision also stems from the careless and irresponsible actions of some of the higher echelons of the USA, who therefore carry complete responsibility for it. Today the US nation has lost not only that minimal protection against hurricanes, which it never had before, and which I installed in the Gulf of Mexico on my own initiative. It has also lost the last hope for a more sophisticated and reliable anti-hurricane system covering the whole of Central America. The latter would not only have made possible keeping the hurricanes’ force to a minimum and barring their entry into the Gulf of Mexico; it would have also solved, in principle and for the foreseeable future, the hurricane problem itself. I developed a new system, which prevented hurricanes from strengthening and maximizing their destructive force as they traverse their entire course. It also created the conditions for transforming destructive hurricanes into tropical thundershowers, which could then continue bringing sorely needed moisture to many eastern and central US states, without which these lands would have turned into semi-arid or desert terrain. Graphic material, which will clearly illustrate the last day of «work» on the wall, will be added within the next few days. As promised, herewith is the graphic material relating to the action of the restraining wall. I created the latter in the midst of the 2005 hurricane season after hurricane Katrina had battered the coast of the USA, leaving in its wake its dire after-effects. I had warned beforehand that I would not neutralize hurricanes in the 2005 season owing to reasons specified in my article. Nevertheless, the protection, which I had already created, weakened Katrina’s force from a category 5 to a category 3. Katrina reached the city of New Orleans, after its force had dropped from a category 5, which it would normally have had without my intervention, to a category 3. Despite this fact, the consequences of Katrina’s strike were catastrophic. Following this, it occurred to me to create a protective anti-hurricane wall. Its first “working demonstration” was Wilma’s neutralization and directional turn. As it follows from the above information, not a single hurricane reached the territory of the USA during the whole season. Hurricanes that came from Africa either turned and went along the wall or made landfall in the form of tropical downpours. The wall operated along both the eastern and the western coasts, which is unequivocally clear from the above. On September 4, 2007 I decided to dispose of the anti-hurricane wall I had created. Up to that moment it continued to perform its task quite effectively. Hurricane Henriette, the only active hurricane at that time, had an immediate response, and began to move according to the classical scheme, which was the norm prior to my setting up the anti-hurricane wall in 2005. There are no 90 degrees turns or “rebounds”, which were clearly observed in 2005 and 2006, after I had installed the wall. After its removal, Henriette did not turn; moreover, it started gaining force and reached the western coast of Mexico in the form of a hurricane. Upon receipt of new information, I will add new comments. On September 4, 2007 I disposed of the anti-hurricane wall that I created in August, 2005 which effectively damped incoming hurricanes for two years. The reason for its removal stems from unreasonable actions of some of the higher echelons of the USA about which I have already written before and find no reason to repeat the explanation of the issue. Today, October 2, 2008, a year has already passed since the day of the disposal of the wall. What are the consequences that the USA suffered because of the dishonourableness of its Government circles? The hurricane season of 2008 is almost over now and we can draw some preliminary conclusions not only about the level of irresponsibility of the higher echelons of the USA, but also about the nature of the anti-hurricane wall phenomenon! I created the restraining wall for the first time. I have never done anything of the kind before. Therefore, it received the most extensive study as a fundamentally new phenomenon. During two years the wall showed its efficiency. Moreover, at the end of August, 2007 I introduced some substantial improvements in it. The necessity to remove that, which I created, strongly disappointed me, but I had no choice. However, this gave me the possibility to get the information about how and what takes place after the removal of the wall which is very important for the study of the nature of this phenomenon. No one has ever had this kind of experience, either I or anyone else. So, the possibility to study in practice the consequences of the removal was the only good that resulted from the careless and irresponsible actions of the USA government. It was noticed that after I disposed of the wall, the hurricanes returned to the natural way of conduct, however, not everything came back immediately to the initial state which had existed before the creation of the wall. The protective field which kept hurricanes out of the Gulf of Mexico stopped functioning almost instantly with the removal of the wall (I wrote about it in the P.P.S. 2a). But the hurricane season of 2007 was almost over and I had to wait for the next season to proceed with observation. The hurricane season of 2008 did not bring many hurricanes, but those few which came were quite enough for drawing some important conclusions. The first hurricane of 2008 worth of mentioning was Gustav. It originated in the Central America and very quickly reached a category 4. It swept over Cuba, being the category 4 hurricane, and then got into warm waters of the Gulf of Mexico. Gustav lost its force a little at the place where the restraining wall was before, but continued to move in the warm waters of the Gulf of Mexico as the category 3 hurricane. cane and exactly in such manner it blasted ashore (Fig. 20). This fell short of the “normal” conduct of a hurricane. The force of the hurricane MUST HAVE GROWN in very warm waters of the gulf! This did not happen, because the “traces” of my pretty intensive work in 2002-2004 still remained! Precisely thanks to them, Katrina dropped its force from a category 5 to a category 3 in the warm waters of the Gulf of Mexico and, weakened, swooped upon New Orleans in 2005. It is hard to imagine even now the magnitude of devastation which New Orleans would have had, if this hurricane had gained its force in the warm and shallow waters of the Gulf of Mexico, as it normally happens, and hit on this city with all its might being already a super-hurricane! The systems which I created in 2002-2004 continued to work and this was surprising. That is why Gustav did not gain its force in the waters of the gulf. When I analyzed these facts, I decided to remove the “TRACES” of my work. As it was demonstrated in practice, the systems which I created continued to work already without my intervention, in case I did not DISMANTLE them. Due to clear reasons, I did not have the least desire to observe how many years it would take for the anti-hurricane systems disappear by themselves or remain there FOREVER! In fact, after I carried out the work on cleansing all the waters on the territory of Archangelsk region in the beginning of October, 1991, the WATER TREATMENT PROCESS continues to operate for already SEVENTEEN YEARS. Due to clear reasons, I had no desire whatsoever to leave such a gift for the American government and I removed the old systems from the Gulf of Mexico. If they do not care about the fate of their own country and its citizens, they bear full responsibility for all the consequences of what is going on. The next hurricane worth of attention in the hurricane season of 2008 was Ike. It began its forming in the very middle of the Atlantic Ocean and when it approached Cuba, it was of an enormous size and force – it had reached a category 4. Ike entered the warm waters of the Gulf of Mexico being the category 1 hurricane. However, unlike Gustav, it began to gain force again (Fig. 21)! It became the category 2 hurricane and continued to gain force, as it should be, but I spared people and prevented this tremendous hurricane from converting into a real monster (Fig. 22), but even then this hurricane appeared to be incredibly destructive! Let this be my last gift to common people who, regrettably, always and everywhere suffer because of the governments’ carelessness and indifference. P.P.S. 4. What did America win by rejecting the restraining wall?! 2008, during which the anti-hurricane wall did not work has already passed. What did America get because of the unreasoning actions of certain higher echelons of government!? It got nothing at all, but lost a great deal! Seventeen tropical storms having been given their proper names made landfall on the East Coast of the USA during the 2008 hurricane season! Eight of them blasted ashore having hurricane status — Hurricane Bertha, Hurricane Dolly, Hurricane Gustav, Hurricane Hanna, Hurricane Ike, Hurricane Kyle, Hurricane Omar, Hurricane Paloma! Eighteen tropical storms made landfall on the Western coast of the USA, seven of which were hurricanes: Hurricane Boris, Hurricane Elida, Hurricane Fausto, Hurricane Genevieve, Hurricane Herman, Hurricane Marie, Hurricane Norbert! In 2008 all these storms and hurricanes freely attacked the North American continent, and… nothing stood in their way! According to official data, the cost of the damage from only one hurricane — “Ike” — which only slightly brushed the coast is $9.8 billion US. Actually, the sum is higher, as official estimates usually differ dramatically from the real ones. For example, different sources mentioned the officially declared losses from “Katrina” to be $50 billion and 300! The total in lawsuits brought against the US government by citizens and organizations, including the state ones, affected by “Katrina” made up more than three quadrillion US dollars! For example, the authorities of New Orleans claimed $77 billion from the federal government! So, it seems that the US authorities, to put it mildly, underestimate the damage caused by hurricanes, it is totally clear why! Well, let it be on their conscience. On the other hand, it turns out that everything happening is advantageous to certain circles in the US Government. Otherwise, how can their indifference to the fact that their own people die, hundreds of thousands of families remain roofless and lose everything they have worked for all their lives possibly be explained? Is it possible that their conduct can be explained by their being unable to ask a person to do something, having become accustomed to dictating their conditions to everyone about everything?! Is it possible that they behave the way they do only because they are unable to control me and that which I do!? But it is a fact, whether they like it or not! I thought that the new US administration would behave more reasonably, than the former president G.W. Bush’s administration did, which made quite a mess of these things and for which they were reluctant to apologize: indeed, the USA does not apologize for anything, certainly not to a person! In fact, they did not apologize for the occupation of Iraq which they carried out covered by false slogans about the defense of democracy in this country. However, the whole world now knows what “democracy” they protected in Iraq, although, few know what the US ruling circles and their puppeteers planned to perform in reality, but this is the story of another day!.. Regrettably, my hope that the new administration would be wiser was not justified! Oh, yes, they came to me with a request/suggestion at the beginning of February, but when I began to determine specifically what exactly they wanted from me, it again appeared to be just another stale old provocation (as I had supposed). Moreover, they turned everything around so that it apparently was me who was bluffing, and when they had agreed to collaborate, I allegedly made myself scarce! In fact, it was not me who did this, but they, after I had expounded to them what it was necessary to do regarding only one parameter which they wanted me to change. I expounded everything in detail and reported that I could do all this and that several years were required, not the one month which they “allotted” to me for solving their problems! There is one more thing. I answered that the term of one month would do to destroy, not create something! Most likely, they were terribly aggrieved, because they decided to show “who is the boss” and… on February 8 in the evening an artificially created hurricane pounced on France and did €1.5 billion in damage! The hurricane reached our castle which is several hundred kilometres from the nearest coast! My wife Svetlana told me about it when the hurricane force wind blasts were already raging around. I succeeded in liquidating it, but several chimney bricks fell and some trees were toppled! Nevertheless, our bicentenary sequoias which had been strengthened by the psi-field generator did not suffer! It turned out that they failed to punish me, the “intractable”. The next day another hurricane was approaching France, and the expected wind speed was 170-200 kilometres per hour! This artificial hurricane was much more serious, and I could not allow a lot of innocent people to suffer because of just a few men’s foolishness and narrow-mindedness. Therefore, I decided not to suppress the force, as I did before, but to turn the hurricane created by the American meteorological weapon on them. As one Russian saying goes — don’t dig a pit for someone, you could fall into it! And also I destroyed the meteorological weapon! As for the second part of my actions: I decided to destroy the whole system of meteorological weapon. Regrettably, its main part is on the surface, in Alaska, where a special complex of electromagnetic radiation emitters was created. The powerful mirrors of the emitters send a burst of electromagnetic radiation to one or another satellite(s) which, in their turn, directly influence the higher layers of the atmosphere which cause the origination of hurricanes. I am not going to explain the principle of action of the meteorological weapon in detail; I would just like to draw a rough sketch of how it works. Therefore, when I decided to destroy the active system of the meteorological weapon and disabled it, the most active, at that moment, part — a US military satellite — reacted first, in which all the electronic devices were totally deactivated! This piece of iron, already uncontrollable, began to change its trajectory and collided with a Russian military satellite! If it were not for this casual collision, nobody would ever know that an American satellite had been destroyed. The more so, that it was eliminated by one person’s force of thought during just several seconds! Certainly, technical equipment has achieved certain success. Nevertheless, no technical device can ever achieve that which the reason of a reasoning creature can, being correctly developed and reaching certain levels of this development! Thus, it is possible to destroy all military and “peaceful” satellites of the USA at once, and not only satellites... And if the United States continues to use any meteorological weapon, I shall always destroy it, whether they like it or not!!! More information in: Niсolai Levashov «Anisotropic Universe», chapter 3. Niсolai Levashov «Spirit and Mind», Vol. 1, chapters 1 and 2.